When I was approached to do a post about Newport Beach and how awesome it is, I couldn't say no. I truly love it in my heart for all the memories I have created there. First as a college student and then as a wife and mother! I don't know if very many of you know this but I went to University of California Irvine for college. In fact, so much of UCI is in Newport Beach, many of us just thought of it as being in Newport. All the cool kids lived in Newport Beach just steps from the water. Back then, it was more important to be steps from the bars! My senior year of college, I lived on Balboa Island. Balboa Island was originally little more than a mudflat surrounded by swampland. Now, it is a beautiful, picture perfect little island off the coast of Newport Beach. The best thing about Balboa Island? 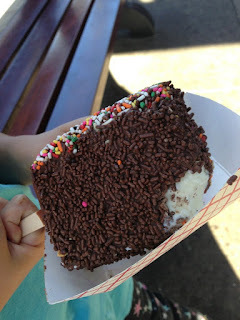 Dad's Balboa Bars! Not my Dad's. The original place is called Dad's. You can also catch an auto ferry from Balboa Island and head over to Balboa Peninsula. Last Christmas, we took a little road trip from San Diego up to Newport Beach. Kids apparently don't feel cold at all. SD Dad and I are bundled up out of view of the camera. Haha! One thing you will notice about Newport Beach right away is that there is an endless supply of GOOD food! But beyond the food, there are so many fun things for families to do! You can explore the boardwalk, grab a shake at Ruby’s on the Balboa Pier, watch the fisherman on the Newport Pier reel in the catch of the day, witness the gray whales migrate on a whale watching excursion, catch the top body surfers in action at the world-famous Wedge, go for a run along the historic Back Bay, run through Crystal Cove State Park after an infamous brunch at The Beachcomber, check out fancy pants Fashion Island (which is dog friendly) and grab a drink at Sharkeez or Mutt Lynch's. I have so many happy memories of Newport Beach and it is so awesome to be able to take my family there on a quick road trip! Check it out over the Holidays. 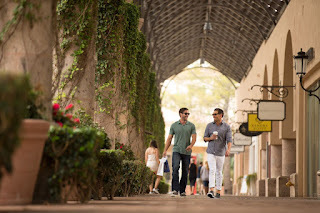 See why it is a favorite day tripping destination for all of Southern California! To find out about all the things you and your family can do in Newport, click here. For deals and special offers in Newport Beach, click here. And for restaurant and dining options, click here. So, when are you going to visit Newport Beach? Will you take me with you? Sounds beautiful and a great place for a nice long weekend! Nice CA showcase! I grew up going to Balboa (both the island and the fun zone), and your post brings back so many wonderful memories! Thanks! I was there during El Nino! That was FUN! Oh my goodness I LOVE balboa island. That ice cream looks soooooo good! Have you tried the frozen bananas? LOVE Newport, grew up near there! I've been to Newport Beach twice and I see why it's a must-visit destination. Great pics! Such a fun place!